Please tell me, why the card is useless? I really cant get it..
Iron Giant, is that you? I missed you so much! Only useful for Mill decks. It is good but I haven't found much use for it yet. I don't know why pepole are not liking this card. It is good against MIlls (they also draw cards) It's good against Handlocks, and any other type of deck that isn't aggro, since everybody want's card advantage, and when they get it... Yeah. 8/8 I the field for 4~6 mana. I like this card, It's only a bad card against Face Hunter and Zoolock. Being bad against aggro is a significant downside due to the popularity of faced paced or even midrange decks. However, I think the main reason that this is a bad card is that relying on your opponent having card advantage as a win condition is usually a bad idea. This card, and mill decks to a lesser degree, will only be good in a significantly more control-oriented meta. Indeed. The meta has changed a lot, and for now you will only win against Patron Warrior, It is 100% NOT a card for climbing the ladder. I've played it as early as 4 and as late as never. Play the card, it's fine, just don't make it your only plan. 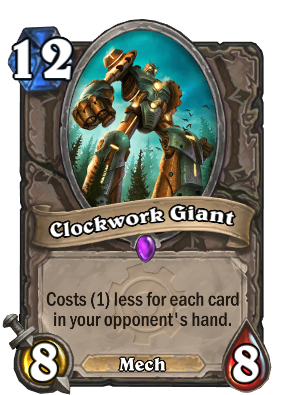 I was excited about Clockwork Giant and Goblin Sapper but seems like Mills are still better without them.